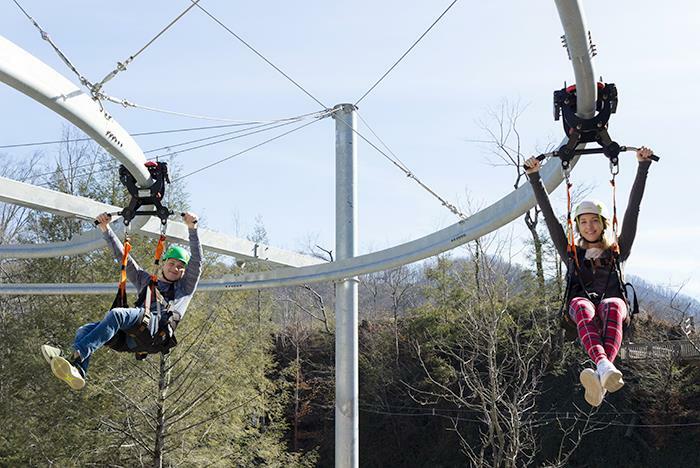 Experience out-of-this-world thrills at Rowdy Bear Mountain in Gatlinburg, TN. 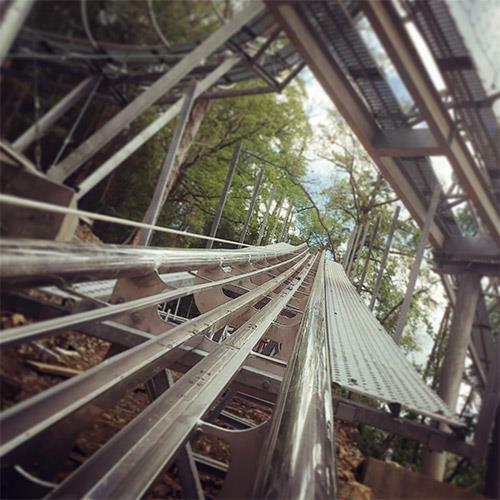 The Mountain Glider is the first of its kind in the entire world that allows guests to sail through the treetops, while the Mountain Gravity Coaster lets you zoom around the mountain. 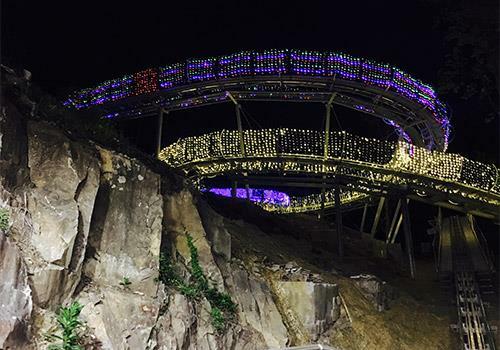 At night, the tracks light up for a one-of-a-kind experience. Choose your adventure at Rowdy Bear Mountain! Choose between Single Rider, Double Riders, or Parent/Child combo for each attraction. 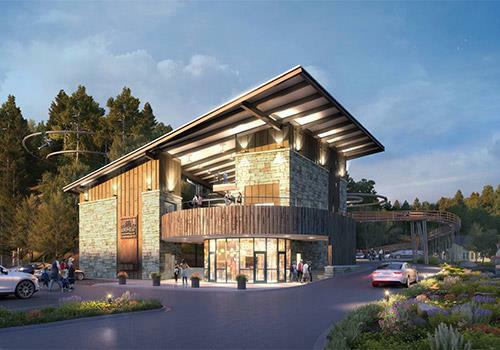 Located in downtown Gatlinburg, among other convenient restaurants and attractions. Gravity Coaster riders must be at least 10 years old and 56" to ride alone. 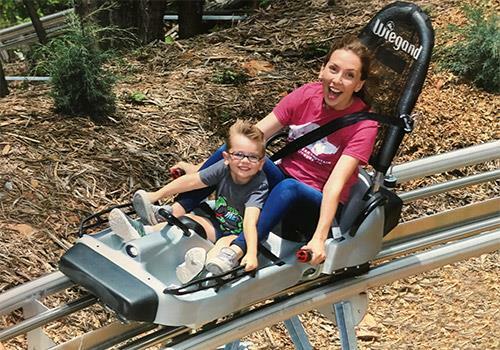 Glider Coaster riders must be at least 48" tall and 100 lbs. Max weight is 250 lbs. 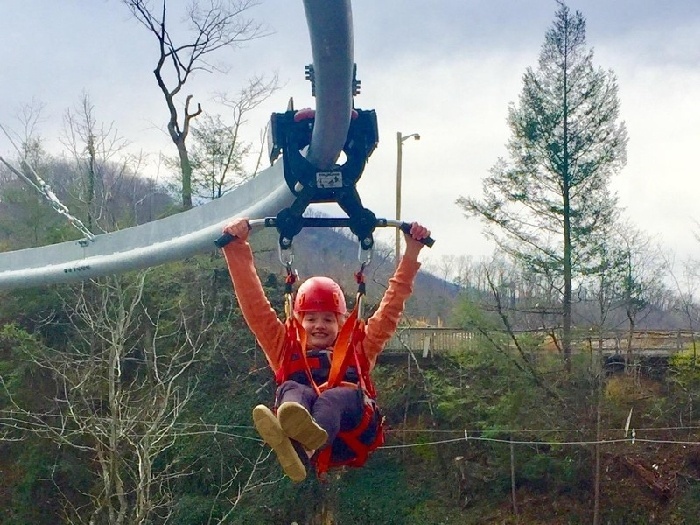 Rowdy Bear Mountain Adventure Park is home to two amazing thrill rides including the First Mountain Glider in the world. 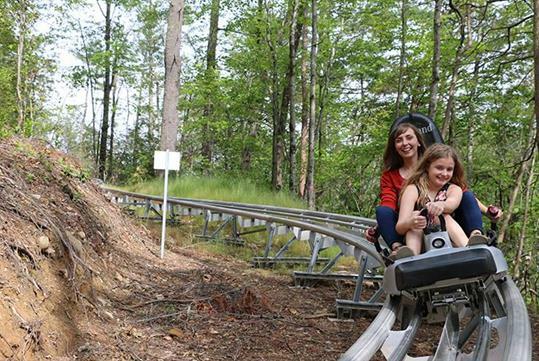 The Glider is a suspended single rail coaster that safely soars through the treetops of Rowdy Bear Mountain. This amazing adventure combines free falling and hang gliding into a safe fun experience. 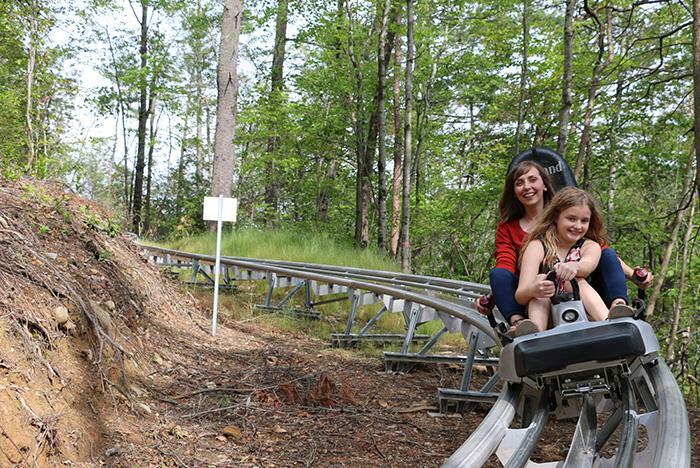 The Rowdy Bear Mountain Coaster is a gravity-propelled alpine mountain coaster that reaches speeds up to 35 mph while it winds through the woods of the Rowdy Bear Mountain. You control your speed! Our coaster carts have the latest Intelligent Distance Control System to ensure our guests have a safe and enjoyable experience. Our track is lit up at night and these amazing rides during the day offer a completely different experience at night. 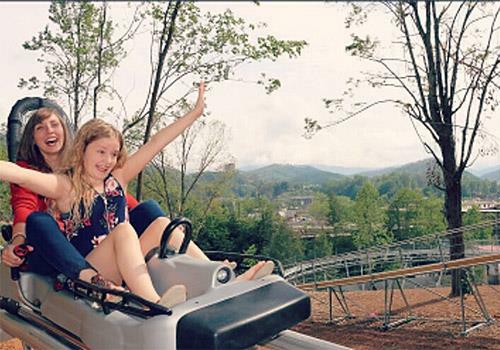 Year-round fun for the whole family, right in the heart of downtown Gatlinburg. Be sure to visit our COMPANY STORE for your very own ROWDY Apparel and souvenirs. We can't wait to get Rowdy with you!! Note: Operating hours may be adjusted depending on weather. Hours may be extended on holiday weeks and special occasions. Where is Rowdy Bear Mountain located? You can find Rowdy Bear Mountain in downtown Gatlinburg at 386 Parkway, Gatlinburg, TN. Yes. Free parking is offered. 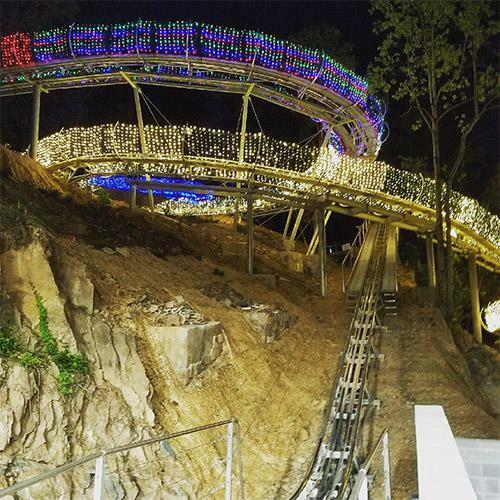 Is Rowdy Bear Mountain open at night? Yes. At night, the tracks light up. Hours of operation are subject to change at the discretion of Rowdy Bear Mountain. Do the attractions have an age restriction? Yes. Gravity Coaster participants must be at least 10 years old and 56" tall to ride alone. Double riders must not exceed 375 lbs total per cart in dry conditions and 330 lbs in wet conditions. For the Parent/Child combo, the child must be a minimum of 3 years old AND 38" in order to ride. Children over the age of 9 do not qualify for the parent/child combo. Driver must be 16 years or older to drive a child 3-9. Does the Mountain Glider have a height and weight restriction? Yes. Riders must be at least 48" tall with a minimum weight 100 lbs. Riders cannot exceed 250lbs.